Winning The Public Speaking Game: The Complete Master Plan For Maximizing Your Profits, Business and Reputation Through... Speaking! According to most studies, peoples number one fear is public speaking. Number two is death. Death is number two? Does that seem right? To the average person that means that if they have to go to a funeral, theyd be better off in the casket than giving the eulogy. Jerry Seinfelds humour here may be too dark for some but it sure hit hard on the point about the fear of public speaking. So why are people so afraid and insecure about public speaking? Whats keeping you from reaching your true income potential? Is it the lack of contacts? The confidence in your expertise? Or is it the inability to reach your market? If youve ever wanted to speak and earn an income with it without hassling with the fear of public speaking than this will be the most important message youll ever read. Because I am about to show you how you can embark on a public speaking career thatll allow you to boost both your income and your self-esteem. Youll be able to open doors you otherwise might not even consider, like book contracts, paid travel, high-paying clients, and even national television exposure. All of this sounds great but of course, if it were truly that easy, everyone would be doing it. Im going to be brutally honest with you becoming a public speaker takes some effort. You need to find an audience, learn to promote yourself, and - like everything else - you need to start at the bottom and work your way up. Does that sound like too much work for very little pay off? You might be surprised. Lets look at some of the reasons why everyone should consider adding speaking engagements to their overall business plan. Life and career coaches - Hold talks about parenting, organization, goal setting, and creating a better home life for your family. No matter what business youre in, there are bound to be groups of people who are interested in what you have to say. Lets say youre a solo-preneur offering ghostwriting services for others. Writers conferences would love to invite you to speak about your experiences as a ghostwriter at their event or people who wants to go into this area would be more than ready to sign up for your course. What about if your family owns a restaurant? Restaurant owner associations would love to engage you to speak about your know-how in managing a restaurant and etc. I Could Never Speak In Front Of A Crowd! Ill Forget What I Want To Say. I Wont Be Able To Answer Peoples Questions. Do all of the above thoughts plague and paralyse you from going into public speaking? Would it surprise you to know that some of the most sought after speakers today actually have a similar list described above and the only difference they might have is that their list is much longer? The same people who today can confidently step onto a stage and wow a crowd of thousands all started out right where you are: terrified to give a short talk in front of their high school English class because they are painfully shy. I decided to combine all the researchall the hours I spent researching on how to overcome the fear of public speaking into a single solution thatll help you launch a successful speaking career. 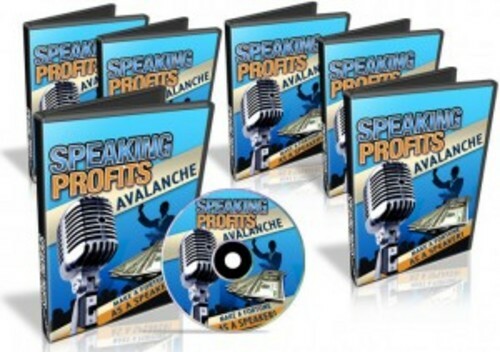 Speaking Profits Avalanche will enable anyone to get started, get engaged with your audience and skyrocket your business profits without having to worry about being a beginner in the speaking business. Youll get the complete ecourse on earning massive profits with Public Speaking. All of this was created from countless hours of preparation, research, experiences and recording. You see, I am very proud of Speaking Profits Avalanche. Because after you use it youll be able to confidently launch your very own public speaking business. Not only that, youll also be able to earn a good amount of profits from it. *ALL* The Most POWERFUL Secrets, Tips, Tricks, Tools & Techniques That Have EVER Been Written (or Spoken) on the Subject of Public Speaking & How to Get Started Are Included in This LARGER-THAN-LIFE Ecourse! - Differentiate yourself with a strong skill set that will set you apart from other speakers and get hold of the best weapon against nervousness! - Defeat the fear that holds you back from achieving your fullest potential - the biggest myth that will kill your new career even before it begins! - The simple step you can take to realise the irrationality of the fear of being judged and what to do about it to avoid killing your speaking career even before you begin it. - Learn how you can overcome the fear that holds you back from achieving success in a speaking career. Youll be in for a surprise when you see how easy it is!